nuneaton coventry three spires charringtons Coventry - Nuneaton In the 1970/80's and a little later! I received a great number of wonderful views to illustrate these notes with and was challenged to find a view to head up this page from the excellent selection received! Since this freight only line had a mix of traffic (cars, coal, oil, ballast etc) it was obvious that one picture would not convey the entire feel of the line, so here is my choice. Here is 25035 passing Foleshill Gasworks on February 12th 1986 with the loaded 6M43 04.05 Ripple Lane - Charrington oil train. This location has changed tremendously since this view, but fortunately both the locomotive and the line are still in service. Not so fortunate was the Gasworks its self, like many monuments to the late 19th/early 20th centuries it has succumbed to 'progress', now the gas comes from the North Sea and the gasworks replaced by a concrete and steel retail/sports centre. This page grew out of the Nuneaton page which detailed the memories of a Nuneaton driver in the 1980's. From this a large amount of material was generously provided by Ron Kosys, enough to create this webpage to feature the freight workings over the Coventry - Nuneaton line during the 1970/80's, and including some more recent notes and views. Unless otherwise stated all the photographs on this page are the property of Ron Kosys and his generosity in providing these should be respected, please. For the purposes of this webpage the pictures and notes hopefully show a journey from Coventry towards Nuneaton (by the points of the compass a south to north progression). One regular job that originated from Coventry was the T46 trip job, in the morning it served Three Spires yard. When the depot at Coventry closed it was switched to Nuneaton, and then for a short while it operated out of Rugby. At the time these photographs were taken Three Spires Yard closed at night. This impacted the evening Three Spires - Didcot working as the empties returned north during the early hours of the following day. On reaching Coventry the empties would be held, and reversed into the former Coventry Carriage Sidings situated alongside Quinton Road at the beginning of the Leamington branch. The trip notices referred to this location as 'Coventry yard', although the yard that officially carried this name was alongside Coventry North Junction where the Birmingham & Nuneaton lines diverged. As well as stabling the returning evening job there could also be wagons present if the lunchtime working to Didcot encountered delays or if other delays stopped a rake of wagons from getting back to Three Spires before the line closed for the night. The boxes at Coundon Road, Three Spires Junction, Bedlam Lane & Hawkesbury Lane would close down for the night once advised by control that the last of the regular trains had run. Generally the signalboxes would open about 05.30 next morning. The above three views set the stage for our journey towards Nuneaton. All were taken on a rather damp June 7th 1978 by Martin Kavanagh. The left and center views show two Down freightliner trains coming off the Leamington branch, hauled by 47337 & 25327 respectively. The presence of the Class 25 suggests a shortage of motive power or a failure somewhere down the line. The right hand view shows 47212 awaiting access to the Leamington branch with an Up freight containing a fine mix of wagons. Just visible at the north end of the station are an approaching WCML passenger service and a Class 25 awaiting its next turn of duty. Here is a morning view of 25058 on April 28th 1986 working the 6T46 07.05 Coventry Goods - Three Spires. The location is alongside Quinton road at the start of the Leamington branch, out of sight behind the photographer is Coventry Power Signal Box. After working the empties to Three Spires the T46 job might be diagrammed for a number of duties - shunting at Three Spires, Engineers trips (usually on the Coventry - Nuneaton line) or working crippled wagons to Hawkesbury Lane. Here the C&W examiners had road access which allowed them to drive alongside the wagons and make their repairs. Ron comments that it was necessary to find out what rakes of wagons were parked at Coventry, what possible locomotives might be allocated to the turn and what the weather was going to be like! Since the first rake was booked away at 07.05 this was definately only photographable with quality results during the summer months. The line to Nuneaton branches off the ex-LNWR mainline just north of Coventry station. The line makes a lengthy curve, some of it on a viaduct before settling down to take a generally northerly path in the direction of Nuneaton. Stations on the line were Coundon Road, Daimler Halt, Foleshill, Longford & Exhall, Hawkesbury Lane, Bedworth, Chilvers Coton. The Nuneaton - Leamington passenger service was discontinued from January 18th 1965 which included the aforementioned stations, excluding Longford & Exhall which had closed during 1949. Passenger trains would return in May 1987, but only as a through route, it was not until the following year that Bedworth station reopened. Coundon Road was the first station north of Coventry. The station was to the north of the level crossing whilst to the south was a small coal yard with several sidings. In the view below of 25211 the buildings and chimneys behind the signalbox and locomotive are the workshops for LTI, London Taxis International (formerly Carbodies), the makers of the famous London Taxi cab. 25211 heads northbound passing Coundon Road station signal box with the last loaded 6M43 04.05 Ripple Lane - Charringtons oil train, the date is May 7th 1986. After unloading at Charringtons the Class 25 will take the train south, now as the 7E53 13.42 Charringtons - Ripple Lane. A dull and miserable February 14th 1986 finds 20084 on the 0M43 Nuneaton - Coventry light engine move. At Coventry the locomotive will pick up the loaded Ripple Lane - Charringtons oil train and take it to Hawkesbury Lane for unloading. Behind the locomotive and brake van are the remains of Coundon station. Ron laments that he did not have a tape recorder to capture the sound of the Class 20 on its return with the loaded train, and that for the photographer this very unusual working took place on a day with very poor light! Coundon Road goods yard used to be the loading point for Massey Ferguson tractors, this traffic was moved to Gosford Green in the spring of 1970 to shorten the turn round times - these tractors were for export through Hull. Coundon Road signalbox after closure and seen here on November 14th 2009. An enthusiast special headed by 31190 is in charge of the 1Z22 Eastleigh - Donnington Freight Terminal, Telford. Partially visible on the front of the signalbox is a banner reading 'Coundon Road Signal Box March 1876 - May 2009'. In the above view the motive power should have been a Colas/Hanson Class 56 but with 56311 out of service and 56312 working intermodals it was switched to 31190 on Thursday. Ron remarks that he was fortunate with the weather this day, within five minutes of the train passing it was very windy and very overcast - oh, and very wet!!! The next station after Coundon Road was Daimler Halt, built to serve the Daimler factory workers. The factory was situated on the north side of the line, in the photograph below it would have been level with the footbridge in the background. The factory, which made Daimler buses has now been raised and replaced by housing, however one of the local streets carries the name Daimler Road. Its July 5th 1985 and the 6T46 Three Spires - Coventry goods is in charge of 25296 as it passes Daimler. This view is taken looking north from the Sandy Lane bridge. The station was situated behind the photographer, on the south side of the bridge. In 1901 a line was opened to connect the Webster's brickworks with the Coventry - Nuneaton line. Changes were made in 1905 to provide a connection to the new Courtaulds Works and an extension to the Coventry Ordnance Works. The Foleshill Railway was about 1.5 miles long and from 1922 became a subsidiary of Courtaulds Ltd. The Coventry Ordnance Works produced heavy naval guns that were shipped out on special wagons built at Derby. In later years a scrapyard next to the brickworks was also served by rail. Officially the line was set to close on February 29th 1972 when Courtaulds switched over their boilers from coal to gas operation. However the miners strike at that time brought forward the conversion date due to the shortage of coal supplies! The line had always been steam worked and at the time of closure there were two 0-4-0ST locomotives in use. 7621 heads east past Websters siding with a down coal train heading for Three Spires or Newdigate. The steam locomotive 'Rocket' was used on the Foleshill Railway which linked Courtaulds and Jacksons scrapyard with the mainline at Websters siding. The date is August 18th 1971. Rocket was a 1926 Peckett 0-4-0ST (1726/26) which spent its entire working life on this line. It eventually reached preservation at Tyseley Museum. A wonderful atmospheric view of the other Peckett (2085 of 1948) at the Courtaulds plant - coal slack is being loaded into wagons. The date is May 29th 1971. An idyllic view of 'Rocket' as the locomotive returns to her shed at the end of a Sunday morning shift on June 27th 1971. In the foreground is the Coventry Canal. The site of the former Foleshill station is the location for 25262 working the 6T46 turn on May 16th 1985. Lockhurst Lane bridge is visible in the background whilst the tall chimney on the left belongs to the Courtaulds factory. Trains heading south from Three Spires encountered a short uphill section on the approach to Foleshill. Here 25321 with a smokey exhaust approaches Foleshill on February 26th 1986 whilst working the 7E53 13.42 Charringtons - Ripple Lane oil empties. Two decades later! Christmas Eve 2009 and the 5Z81 Southall - Carnforth ECS is powered by 47245/826/760 & 37706 through Foleshill. Ron comments: Four locomotives on coaching stock is very rare but have managed it with a couple of freights. Its always difficult to find somewhere you can photograph and see the four locos, this is from the Lockhurst Lane roadbridge as it approaches the site of the former Foleshill station, about five minutes after the sun had well and truly died for the day. There might have been only minimal snow in this photograph, but it was flippin' cold! A busy scene at Three Spires on May 26th 1983 looking in the Nuneaton direction. Just visible on the right is the last coal wagon of a train waiting to back into Three Spires yard. In the center is a Class 47 leading a very late running Charringtons oil train bound for Hawkesbury Lane. And to the left in the middle distance is 25301 shunting in the yard. In the distance is Bedlam Lane crossing which features in several of Driver Dave's stories. The 6G79 05.18 Lenton South - Three Spires winds its way into the siding behind 45049 on May 28th 1986. This trainload of coal will be used to create the smokeless fuel produced by the Homefire plant. Late in 1976 it was suggested that this traffic be switched to road haulage. Fortunately objections by local residents prevented this transfer from taking place. At the time 30% of the coal recieved did come by road. Another view of the diamond crossing at Three Spires, showing its use here on September 10th 1985 by the 7V44 09.34 Three Spires - Didcot. This view also illustrates the gradient from the yard down to the mainline, in a very short whill 58015 will be soon pulling upgrade towards Foleshill. 25058 and its mgr empties are seen backing into the siding alongside Three Spires Junction signalbox on April 28th 1986. It would then draw forward into the reception road in the yard. This is the same train as seen above in the Coventry view. Coventry Colliery also served Garston, normally worked via Nuneaton with the empties arriving mid-afternoon. On May 28th 1986 the train unusually arrived from the Coventry direction behind 45129, definately a rarity for a train which by this time had become a solid Class 58 working. To the left is the remains of the trackbed of the Coventry avoiding line. The coal traffic to Garston was intended for export to Northern Ireland. This loaded working left Three Spires late in the evening so was not normally photographable, however as seen in the above view with 45129, the empties returned in daylight hours. Anyone remotely familiar with Three Spires or anyone taking a close look at the train working into & out of the yard will realise that during the 1970/80's access to the yard was quite convoluted. From the Coventry direction there was no direct access into the yard. Trains from this direction had to draw forward to Bedlam crossing, then reverse back into the siding alongside Three Spires Junction signalbox, then pull forward into the yard. Merry-go-round workings would normally run into the reception road (the track on the far left of Three Spires yard). To leave the yard the Coventry bound trains at one time had a direct exit using the diamond crossing visible in several of the views above. However following an incident with this trackwork the diamond was not repaired so the trains had to carry out the laborious manouvre of drawing forward into the siding alongside Three Spires Junction box, then reversing out on to the mainline towards Bedlam crossing, then setting off in the Coventry direction. Another view from a lightpost, looking south showing 58015 leaving Three Spires on September 20th 1988 with an extra for Bescot. 58015 has already worked the morning round trip to Didcot and would normally have run light to Saltley. However this day there is an extra working conveying household coal and bagged barbecue fuel. The above view shows the recent removal of the diamond and the leads to it from Three Spires Yard. The loss of this trackwork would cause considerable extra work in drawing forward and setting back for any trains wishing to enter or leave Three Spires Yard for the Coventry direction. A major rebuilding in the 1980's led to the only connection into Three Spires yard being moved to the Coventry end of the former siding which ran behind Three Spires Junction signalbox. This now reversed the situation with the trains to/from the south having easy access to the yard. Trains to/from the Nuneaton direction were now required to complete the reverse moves on entering/exiting the yard. The new A444 dual carriageway opened up the east side of the line for a while. From this new vantage point 58037 is noted working the 6D85 08.25 Three Spires - Toton empties on June 24th 1993. Coal was brought in to Three Spires to be blended with the local Keresley/Coventry coal to produce the Homefire Smokeless fuel. In the view above the former junction of the Coventry Avoiding line was situated to the left about two thirds the way down the train. This train ran daily and since slow speed control was not required it could produce any type of locomotive and any type of wagon prior to the standardisation of the HAA merry-go-round wagons. The view below was taken about twenty years after the Class 25's had been taken out of service, and as mentioned eleswhere in these pages the Coventry - Nuneaton area was host to some of the final Class 25 workings during March 1987. In contrast to the above views, mostly taken during the 1980's here is a comparison view taken on August 3rd 2007 with 66099 in charge of the 6A61 ProLogis - Wembley. As mentioned in the text above access to the yard is now from the Foleshill direction and all signs of the earlier access to the yard has been removed. As one can see the changes are considerable but fortunately the Coventry - Nuneaton line is still present and laid now with continuously welded rail. The 'branch' still exists, now known as ProLogis branch and served by the ubiquitous EWS Class 66's. These had been diagrammed from the start of the ProLogis workings, but they encountered difficulties if they should become stopped at Wheelwright Lane crossing whilst waiting for the barriers to be lowered. They had difficulties even when the rails were dry! The logical answer was to work them in pairs but this was a waste of resources when coming all the way from Wembley. Ultimately the train was split at Coventry, the Class 66 being able to handle the train over the branch once it had been split in two! The Class 60's, when tested on the working, handled it with no problems, including the Wheelright Lane standing start. However regular Class 60 power could not be guaranteed so the solution as mentioned above was used. However much of the infrastructure found in the earlier pictures is now heavily altered. With Coventry Colliery and the Homefire Smokeless Fuel plant closed and raised to the ground the reason for Three Spires Yard is now gone, along with all the trackword required to access the yard. Bedlam Lane and its signal cabin are no more, now replaced by a bridge (almost a tunnel) which carries the A444 over the railway. Beyond the crossing the gasworks and gasholders have gone, replaced by the Ricoh Arena, home to Coventry City football club, a hotel, gambling casino and conference center. And many of the visitors to these facilities park their cars on the site of Three Spires yard. And as with many before & after views one noticeable change is the increased amount of foliage alongside the right of way. Hopefully all those trees & bushes will assist in combatting the increasing pollutants being thrown into the atmosphere. Not quite twenty years on, this view is from January 17th 1999 and shows the demise of Three Spires Junction signalbox. The closure of Coventry Colliery & the Homefire plant led to the mothballing of the signalbox. Vandals did the rest to this typical LNWR signalbox. In the background can be seen bridgework and abutments for the rerouted A444. This initially opened up some vistas of the railway looking south, but this quickly disappeared as the trees & bushes grew back. Below are several views of Three Spires Yard, mostly taken after the demise of the Class 25's. During the mid 1980's the yard would be very busy, daily supplying Didcot with three 45-wagon merry-go-round trains. The coal mined from Coventry Colliery was of high calorific content. Coal from other collieries was blended at Didcot with coal received from Coventry. Brand new 58029 waits in the yard for its train to be made ready, the 7V44 to Didcot power station of May 6th 1985. To the left are NSF No. 2 & 3, and to the right is 31293 on the T46 job. A general view of Three Spires Yard on April 9th 1987. The yard contained thirteen roads, with the extreme left one being the reception road. 58037 is visible on the right with the 7V44 working to Didcot. Looking up the yard on February 23rd 1993 finds CPL No.1 in charge of four wagons at the south end of the yard. Change is already underway as a road now occupies the boundary of the east side of the yard. After the yard closes it will become one of those great monuments to the late 20th Century - a car park. The small road (Bedlam Lane) that crossed the lines just to the east of the entrance to Three Spires Yard had its own signal cabin to control the hand operated gates. For most of its existance the cabin did not carry a nameboard. However near the end of its existance a 'Bedlam Lane' street sign was found one day propped up against the cabin! 25265 works the 6T46 Coventry - Three Spires on October 7th 1986. Once the end of the train has cleared the points just visible somewhere underneath the middle of the train, the train will set back into the siding alongside the main lines and then draw forward into the yard's reception siding! Looking in the opposite direction from the above view 58037 is well and truly blocking the Bedlam Lane crossing as it sets out for Didcot with the 7V44 Three Spires - Didcot coal train on April 9th 1987. The train has just reversed out of the siding behind Three Spires Jct signal box, across the down line and on to the up line. This was a recent change due to problems with the diamond crossing which allowed direct access from Three Spires Yard to the up line. This view changed dramatically with the major improvements to the A444 road. Its a gloriously wet July 29th 1985 as 32120 crosses Bedlam Lane with an unusual extra job originating from Tyseley. Between the brake vans is NCB SWM 24 which is returning to Coventry Colliery after tyre turning at Tyseley. This location would now be directly beneath the A444 overbridge! I suppose it defies logic that Hawkesbury Lane signal box actually controls the level crossing for Blackhorse Road and that a search for Hawkesbury Lane itself can lead one into a labyrinth of historical details about the Foleshill/Bedworth area. 25175 at Hawkesbury Lane on August 6th 1985 with the 8T95 Nuneaton - Leamington. This is a trainload of spent ballast for Whitemans yard at Leamington. From here the ballast would be sold for various construction uses. Just visisble on the left is the connection to the Charrington's oil depot. 25269 at the south end of Hawkesbury Lane yard on a frosty February 27th 1986 working the 6T46 job. 25269 is seen here shunting some engineers wagons in the shadow of the bridge that takes the M6 motorway over the yard and the mainlines. Time was short for 25269, it has about a month left in service, being withdrawn on April 2nd 1986. A hazy September 21st 1971 at Hawkesbury Lane as parcels unit 55993 with several parcels wagons in tow heads west towards Coventry. At the time of this photograph the remnants of the platforms are still in place (compare with the view of 25175 above). Also present are the once familiar lineside telegraph poles and wires, these too are gone from the 25175 view. Just visible to the left of the parcels unit is the access to Charringtons siding. (May 2009) As on many secondary routes much of the infrastructure survived for far longer than the locomotives and rolling stock that they had protected over the years. But even these seemingly permanent fixtures become redundant and disappear. So it was that at approximately 23.45pm on Friday May 22nd 2009 the Nuneaton - Coventry line came under a T3 possession, the last train to be signalled by Hawkesbury Lane box was an Up Freightliner service (23.30pm apx) heading to Southampton, later on that evening all the semaphore signals and other equipment were taken down by contractors and the commissioning of the new LED signalling equipment was underway. By late Saturday afternoon the signal box was locked up for the last time and all the windows boarded up. Presumably by Tuesday May 26th normal services had resumed with the line now under control of the West Midlands signalling centre. The three photographs below come from the final days of the signalbox. The left view shows dmu 153325 taken from the signalbox on March 29th 2009 as it heads towards Coventry, the site of the station being amply covered by vegetation. The center view shows the Hawkesbury panel on December 10th 2008, with a small selection of model railway items on the shelf beneath the panel. The right views shows the boarded up signalbox on May 25th 2009. The three views below and the May 2009 notes are graciously provided by Anthony Sutton. Ron describes the Charrington's oil train as his little baby. It initially ran on Tuesdays only and was booked a Class 81/85 to Coventry. Here the electrics were replaced by a diesel for the run up the branch to Hawkesbury Lane where the Charrington's sidings were located via a spur off the down line. There were two discharge sidings which required the train to be split in two, the train having reversed into the sidings. The standard train length was twenty five 4-wheeled tanks. After the tanks had been emptied the two sections were marshalled together, pulled forward onto the down line towards Nuneaton, then backed into Hawkesbury Lane where the locomotive ran round and then headed off towards Coventry. The empties were booked for an afternoon departure from Charrington's. At Coventry the electrics would take over the working. However in later years the locomotive change might take place at Rugby, or often the diesels would work all the way to Willesden. During 1976 Stratford Class 47's began to work the oil train throughout. Its February 10th 1981 and it looks like a cool, damp morning as 47123 waits in Charrington's yard for its train to be discharged. At this time the Class 47's were still allowed into the yard. A Class 25 passes on the mainline with ballast wagons whilst Dave waits on the lead at Charringtons siding on February 10th 1981. In 1985 Charrington's won the contract to supply heating oil to Warwickshire area schools. This led to booked workings running up to five days per week. Also the condition of the track in Charrington's sidings prevented the use of heavy locomotives so the Class 25's became the booked power. Unfortunately the increased workings mostly occurred in the colder winter months with its inherent problem of bad weather and poor light. 25059 at Charrington's two road siding on February 25th 1986, discharging the contents from that morning's 6M43. Ron's diligence in documenting the local activity created friendships, such that the staff at the Charrington's depot would contact Ron to let him know their train was running, that it had a Class 25 on the front and where it was at the time of their phone call! Here is 25211 at Charringtons on May 7th 1986 preparing to depart with the last set of empties back to Coventry and then on to Ripple Lane. Hawkesbury Lane signal box is in the background. The Charrington's working ended on May 7th 1986 when the depot was closed, its work transferred to their Brownhills facility. Ron was on hand to record both the north & southbound workings on this day, some of which are featured on this page. 25211 was the locomotive in charge on this day, though it would not outlive this working by much. On July 25th 1986 it was taken out of service at Bescot, but lingered here for the next nine years, avoiding the call to the scrappers at Swindon & Doncaster. Instead in 1995 it was taken to MC Metals, Glasgow where they quickly laid it to rest, the last non-preserved Class 25 in existance. Charrington's depot was situated alongside Blackhorse Road, after closure the majority of the depot was demolished and the rails removed, the vacant land was later used by a truck rental firm. Three views of Newdigate Siding signalbox, courtesy Martin Kavanagh. With regard to the above views Martin writes that a friendly signalman would let him spend a day in the signalbox! The signalman also worked the Hawkesbury Lane box. When his shift ended and the timings were right he would catch a lift on the Class 47 going down to Gosford Green, he lived not far from the line. A week after these above views were taken the sidings were closed. This depot opened in November 1967 with two roads for unloading. It is necessary to split the train in two to permit unloading. Building the train requires attaching one set of wagons, drawing forward onto the Up line, then setting back to collect the tanks in the second siding. With the train made up it will pull forward to Hawkesbury Lane where the locomotives will run round and take the train towards Nuneaton. During 1970 three services served this depot, one via Coventry and two via Nuneaton. The Coventry working was the 6M43 loaded Thames Haven - Murco & 6E52 empties Murco - Ripple Lane. This was elkectrically hauled over the WCML, with a Class 25 for the short run to Murco. 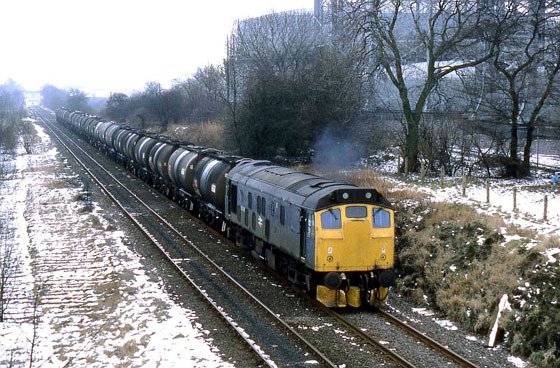 The two workings via Nuneaton were the 6G37 loaded from Ellesmere Port and 6F38 return empties. This was also electrically hauled from/to Nuneaton on the WCML. The other working was diesel hauled throughout, the 6M55 loads from Immingham returning as the 6E37 empties, the Immingham based class 47 requring a reversal at Nuneaton. Looking like its trying to wear its cargo as part of its livery, 31154 and sister 31203 wait in the yard at Murco for the oil tanks to be unloaded on April 14th 1989. Pairs of Class 31's worked these trains for a number of years and would ferry crews to Nuneaton rather than waiting in the yard for the trains to unload. After the Class 31's came Class 60's & 66's on these workings. The Murco empties head northbound through Bedworth on July 10th 1989 behind 31207 & 31201. The view is taken from Marston lane bridge, in the distance is Bedworth station. 20045 & 20071 head south through the closed Chilvers Coton station on May 16th 1985 in charge of the 7T51 12.00 Bescot - Three Spires empties. This was normally a regular Class 25 working, the use of Class 20's on this working at this time was very rare. The above working featured the T51 tripper from/to Bescot and later switched to Washwood Heath with the introduction of the Speedlink Coal Network. Its main purpose was to move household coal from the colliery and smokeless fuels from Homefire to many points across the rail network. Bagged barbecue fuels in open wagons (OBA's) and the occasional closed wagon also used this working. Export coal to Northern Ireland through Garston also provided this service with much traffic in addition to the daily Garston working. Three Spires was the site of the junction for a goods line running south east to connect with the Coventry - Rugby line at Humber Road Jct. Frequently known as the Coventry avoiding line it serviced a number of industries along the route. In October 1963 the junction at Humber Road was removed, the line being worked as a long siding from Three Spires Junction to Gosford Green to serve the Chrysler car plant. The trackbed of the abandoned avoiding line would later form the basis for major improvements to the A444 Coventry - Nuneaton road. In the view of the Class 25 below the new dual carriage road now parallels the railway. A roundabout is now located somewhere behind the Class 25, and has sensibly been named 'Three Spires Junction'. 7613 heads towards Coventry on August 4th 1971 whilst 1842 waits to come off the Coventry avoiding line with a car train from Gosford Green. Just out of sight to the left is Three Spires Junction signal box. Nuneaton driver Dave Smith remembers his first trip down the branch with a Class 25 and a load of new cars. On one piece of track the locomotive leaned a good way to the left and then back again, he felt sure some of the load of new Sunbeams would be going down the bank! Class 47 1958 arrives light engine at Gosford Green on June 23rd 1971 to take up its northbound working. The blue Rootes Group (later Chrysler) freightliners on the left are loaded with Hillman Imps in kit form, for delivery to Scotland where they will be assembled at the Linwood plant as part of a strategy for using massive tax subsidies to ease unemployment in Scotland. Class 47 1958 has now dropped down from the branch and entered the Gosford Green yard, June 23rd 1971. Class 47 1844 backs on to its train load of cars at Gosford Green on July 13th 1971. The Rootes freightliner service commenced running on December 19th 1969, typically with ten vehicles, each carrying two containers. At this time electric traction was used between Crewe & Nuneaton, 7629 took the train on to Gosford Green. A road crane dealt with handling the containers pending the introduction of a travelling crane. The daily car train from Linwood to Gosford Green was diesel hauled throughout, frequently in charge of a Class 50 to Nuneaton, where a Class 25 would take over to Gosford Green. The Gosford Green container terminal was formally opened on February 11th 1970 with the arrival of the first container train behind 1835. Nine trains were scheduled weekly with trains of up to sixteen flat wagons each carrying two containers. Arrivals were twice daily at 04.50 and 19.04 with departures at 06.10 and 17.00. Class 25's continued to handle these trains between Nuneaton & Gosford Green frequently requiring light engine moves to/from the car terminal. One exception was the 4M34 locomotive which after dropping off its train at Gosford Green would run light to Coventry to handle the local job to Nuneaton. For the rest of the week it handled the empty 6E52 morning oil tanks from Bedworth to Nuneaton, with an electric taking the train southwards to Ripple Lane. Observations in early 1971 showed the car trains running very well loaded. The locomotive for the 4S33 was frequently worked throughout by a Class 47 which ran light from Nuneaton. Such was the volume of traffic that the car transporters were sometimes stored in the sidings at Three Spires Junction. By early summer the workings no longer used electric traction between Nuneaton & Crewe, locomotives diagrammed were either Class 47's or pairs of Class 25's. During December 1971 a new car terminal was opened at Bell Green, three trains per week were initially running and all powered by Class 47's. The facility opened prior to completion of all the trackwork requiring trains to go forward to Gosford Green, then set back to the new facilities at Bell Green. The coal miners strikes during the first quarter of 1972 saw traffic over the Nuneaton - Coventry line considerably reduced apart from the car traffic. The car trains proved less fortunate when the 'work to rule' occurred in mid April caused delays to some services due to missing locomotives and other delays caused by signalmen in the Coventry area. The Bell Green workings came from two locations, the 4G40 from Halewood, returning as the 4F30 to Speke and the 4E32 to Dagenham Dock, returning from there as the 4M36. Locomotives for these workings were generally Class 47's from the Birmingham or Stoke Divisions, however the Dagenham Dock workings could from time to time produce an Eastern Region allocation Class 47. Despite the increasing use of the Three Spires Junction - Gosford Green line for car trains the Coventry City Council were already looking ahead to use the course of this line for a new road! By this time Humber Road Junction at the south end of the line had been closed. A dispute at the Chrysler plant in May 1973 led to the cancellation of all the Linwood services. Consideration was also being given to moving the terminal to Binley. From July 1975 electric traction to/from Nuneaton was diagrammed for the Linwood - Gosford Green services, with the WCML electrification almost complete it was time to take advantage of it as much as possible. In January 1976 the the car facility at Bell Green closed. Additionally the reorganisation of Chrysler at this time would affect the volume of rail traffic at Gosford Green. Service from Bell Green commenced early in January 1978, being combined with the Linwood traffic. Departure was from Linwood at 20.30, arriving Gosford Green at 06.35. The return working headed north at 18.40. During August 1981 the public freight facilities were withdrawn from Gosford Green. Traffic was now sparse here, the Freightliner service operated infrequently following the loss of the Talbot traffic. The branch from Three Spires Junction to Gosford Green finally closed during September. Lifting of the Gosford Green branch commenced during February 1982, on February 23rd 25265 was in charge of a demolition train on the branch, although progress was initially extremely slow in the demolition. A vigorous attempt commenced in March 1984 making much better progress than previous attempts in removing the redundant track and infrastructure. Early in September lifting of the line had reached Three Spires Junction, by September 9th 1984 the junction had been removed. Should there be no communication between the signalman at Three Spires Junction and Gosford Green, a train must not be allowed to proceed on the Up goods line from Three Spires Junction until the time usually taken by the preceding train to clear the section plus an allowance for a train having been stopped and having to run at a reduced speed. Should the guard of a Down train waiting to depart from Gosford Green be unable to contact the signalman at Three Spires Junction he may authorise the train to depart after the time usually taken by the preceding train has elasped and he has advised the driver of the failure and instructed him to travel at caution, stopping at Bell Green if necessary. The above notice may be a response to the vandalism which plagued the branch in it's later years. Frequently when the trains were standing at the signals the local kids would pull the release valves which would then require the guard to reset the brakes. He would normally travel in the rear cab of the locomotive, but was frequently found riding on the rear vehicle until the train reached the Nuneaton line. Its August 4th 1971 and 1842 is first noted light engine coming round the curve from Three Spires Junction heading for Gosford Green. In the second view it is regaining the mainline at Three Spires now with its train of mostly empty Cartic wagons in tow. Some of the wagons at the rear of the train are loaded with cars.